You won't come across many books as packed with useful information to a writer as this one. I honestly didn't know what to expect when I was offered a free copy in exchange for an honest review, but the wealth of detail here is, frankly, brilliant. 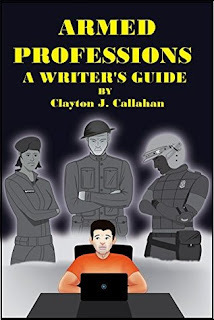 Clayton Callahan is a former US Army Counterintelligence Special Agent, and he provides a meticulous walkthrough of the various military and law enforcement bodies that exist - chiefly in the US, but with an eye to the rest of the world too. From lists of the various rank structures in different military bodies through to small unit tactics and radio jargon, you'll find a vast amount of useful material if you're a writer creating work that involves such organisations. Now, that in itself sounds quite dry, but Callahan bolsters that with asides from his own experience that really brings the material to life. He even extends current practices forward and back in time, giving examples from legionnaires of Rome through to possible structures of a far future military. Throw in the copious references he provides to other source material, and you have what is an essential book for those writing about the military or law enforcement. If I had any criticism, it's that it could do with one more pass through a proofreader, but frankly the raw knowledge and inspiration you'll glean from this book far outweighs any negative. Brilliant work, Mr Callahan! Armed Professions: A Writer's Guide is available on Amazon.